Private saunas and a lounge bar are featured at this boutique hotel, located 10 minutes’ drive from the Palace of the Republic in Almaty. 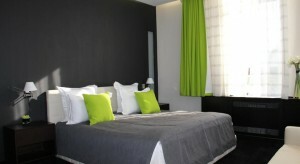 Rooms include design interiors and free Wi-Fi. All the stylish air-conditioned rooms at Donatello Boutique Hotel have modern décor and a flat-screen TV. Bathrooms are fitted with a bidet, slippers and bathrobes. The Manana Restaurant with serves traditional Georgian and European cuisine. Guests of the hotel can relax in the spa centre with a steam bath, saunas and a massage service. Chimbulak Ski Resort is 20 minutes’ drive away. Almaty city centre is 10 minutes’ drive from Donatello Boutique Hotel, and it is 25 minutes by car from Almaty 1 Train Station. A shuttle service is available on request, and Almaty Airport is 30 minutes’ drive away.